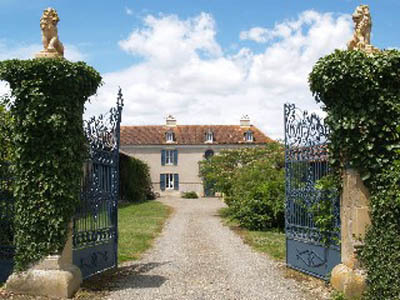 Pignoulet is situated in the Gascony/Gers region of the south west of France and located in the centre of what was once a wealthy farming village community. 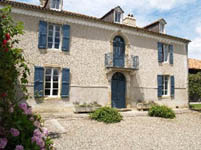 With wonderful views of the Pyrenees, the house is almost equidistant (5–7 miles) from the surrounding small towns of Maubourguet, Plaisance and Marciac – Marciac being renowned for its international jazz festival in early August. In a charming well kept garden of 2.5 acres and set well back behind wrought iron gates guarded by stone carved lions, the house is surrounded on all sides by wonderful and numerous outbuildings, including a covered area attached to the kitchen for outside dining – part of a row of barns that stretch all the way down the drive; an enchanting patterned brick poulailler (chicken house) on two floors; a huge south-facing open fronted barn ideal for ping pong; cowsheds and the old milk parlour; and more and more as you explore. And not forgetting the secure pool in its own orchard garden on the west side of the house. 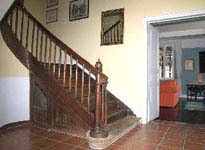 Lovingly restored, completely refurbished and decorated to a high standard of comfort and taste, this mellow and elegant 18th Century Gascony farmhouse combines the original grandeur of the front facade with a brand new conversion of its Wine Chai at the back, providing spacious accommodation for 12-14, with six double bedrooms plus two extra bunk beds in the children's room and four bathrooms. Beautiful carved oak double front doors open into the Hall with terracotta tiles and a lovely staircase leading to the main landing and bedrooms. 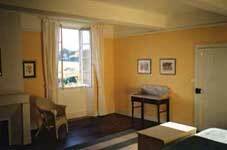 From the Hall, there are two reception rooms approached through original double doors. 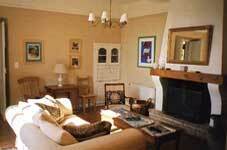 On the right, a south & east facing Salon with good oak polished furniture and big comfortable sofas. 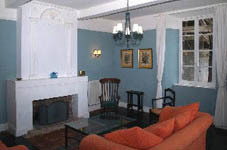 To the left of the hall is the south facing Family Room, with TV and Video/DVD players, a huge sofa, chairs and mainly old pine furniture which leads to the fully equipped Kitchen, through which you reach the Washroom, Downstairs Shower Room and on to the back stairs. 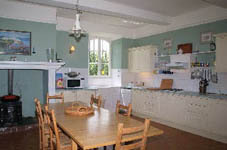 The large kitchen has a dining table with 12 chairs, a dishwasher, microwave, fridge, freezer, electric hob and oven. 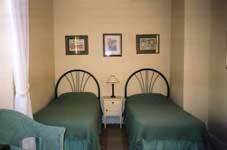 An extra oven and larger fridge are housed in the Washroom next door to the kitchen, together with a large double sink and washing machine. A rotary washing line is situated outside the back door and there are extra undercover drying lines in the nearby barns. The landing at the top of the first flight of stairs has beautiful double balcony doors with glorious coloured and patterned glass panels. It’s from here, when weather conditions are right, that you get the best view of the Pyrenees. 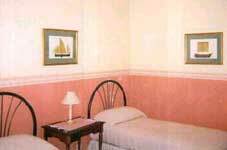 The three main bedrooms are all spacious measuring 20' x 20' by 10' high and are in the front of the house, all with comfortable king-sized double beds and one (the master bedroom) has an en-suite bathroom. 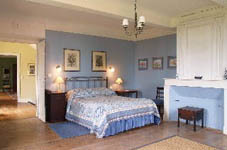 The blue bedroom has east and south facing windows, the green room (with a family heirloom bed of incredible comfort) faces south and the yellow bedroom overlooks the pool garden to the west. 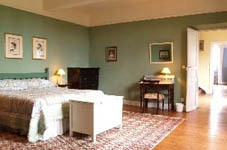 Three further double bedrooms with twin beds (the one especially for children has 2 bunk beds as well) and 2 large bathrooms (with bath/showers, basins & loos) have all been converted from the Wine Chai and are approached from half-way up the main staircase, through a doorway and up a short flight of stairs. 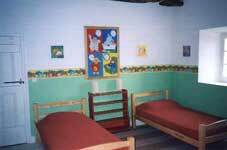 To make a booking or for further information please contact us using the information provided on the contact page.